Alberta 55 plus | News Clip: Take a bow, High Prairie! Very well done! News Clip: Take a bow, High Prairie! Very well done! Take a bow, High Prairie! Very well done! The host committee of the Alberta 55-Plus Fall Games: left-right, are area director Renee Simard, secretary Velvet Davies, area director Ruby Morrison, casino co-ordinator Wendell Ebbett, of High Prairie, treasurer and membership director Mike Bain, vice-president Freddi Bromling, Town of High Prairie Councillor Debbie Rose, High Prairie and District Regional Recreation Board recreation director Lori Matthews and president Mary Zabolotniuk, of High Prairie. Missing in the photo, are Kay Savill, of High Prairie, and food services co-ordinator Marilyn Stevens. High Prairie has been given top marks for hosting the Alberta 55-Plus Fall Games on Sept. 14-16. “The overall impression was wow; great facilities and great community participation,” says Wayne Davies, president of Alberta 55-Plus. 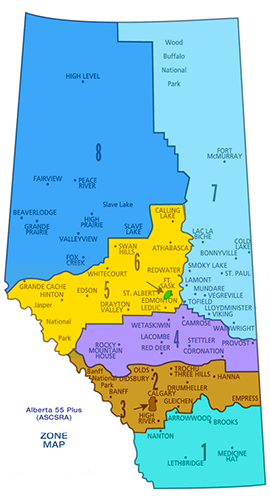 Organizers were especially grateful to the High Prairie and District Regional Recreation Board. “The volunteers were exceptional and we could not have put on this event without recreation director Lori Matthews and the recreation board,” Davies says. Many local homes were also opened to accommodate participants from out of town. “When we needed rooms for billets, residents responded way beyond our expectations,” Davies says. Nine events were staged in the Gordon Buchanan Recreation Centre, High Prairie Curling Rink, Jaycee Park, High Prairie Municipal Library, High Prairie Legion and High Prairie Golden Age Centre. The games were brought to town by local longtime resident Mary Zabolotniuk, president of the Mighty Peace Sport and Recreation Association [Zone 8]. “For a small town, High Prairie did a great job to host the games,” says Zabolotniuk, who recently moved to Peace River from High Prairie. “I’m proud of High Prairie, my hometown. It included funding from Big Lakes County and the Royal Purple Elks, she notes, and other support from volunteers and organizations. “Everyone involved in the games was proud of High Prairie,” Zabolot- niuk says. She greatly appreciated the work of the recreation board. “Lori and her staff did a wonderful job,” Zabo- lotniuk says. Zabolotniuk was thanked for her leadership by Matthews and Town of High Prairie Councillor Debbie Rose, who gave her a package of gifts for the 150th birthday of Canada at the banquet Sept. 15. “I had tears in my eyes,” says Zabolotniuk, who also got a standing ovation from the crowd. Accolades were also expressed by High Prairie Mayor Linda Cox. “The organizing committee did a fantastic job and raised the bar high for the next community hosting the games,” Cox wrote in her mayor’s report for the council meeting Sept. 26. Events included bocce, crafts, duplicate bridge, military whist, cribbage, darts, euchre, floor curling and floor shuffleboard. 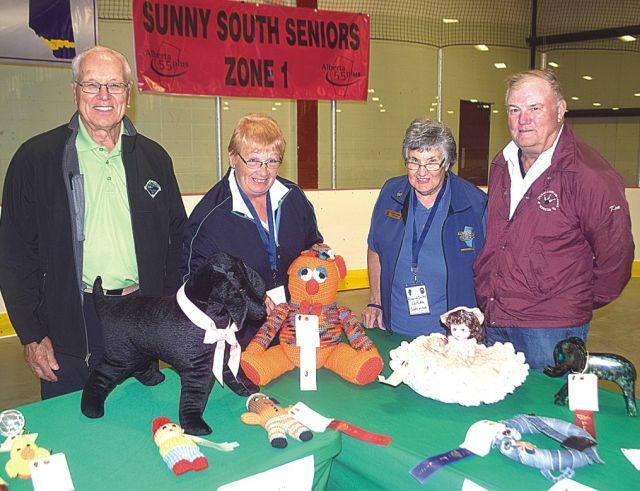 Many crafts were made in the Alberta 55-Plus Fall Games. 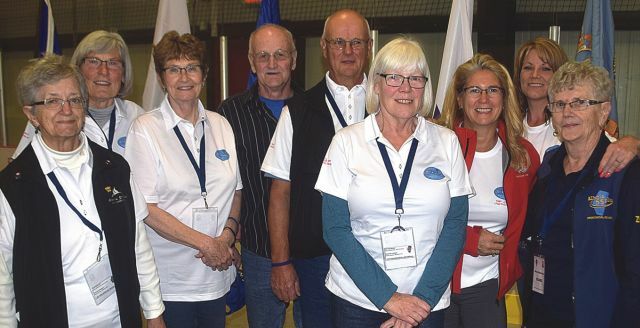 In the photo to the right, left-right, are Frank Snopek, of Camrose, Sue Boswell, of Big Valley, Zone 4 president, Rosella Snopek, of Camrose, the games cultural co-ordinator and Zone 4 activity director, and Ken Allen, of Fairview, Area 4 director.